Anton Bruckner's initials (A+B[-flat]) provide the opening gesture of the 1st movement of this work. The beginning of the principle theme from Bruckner's 8th Symphony is briefly quoted and passes in the course of the movement through multifarious metamorphoses which work up to a climax. Eight bars piano form the bridge to a coda, in which the elements of the movement reappear in changed guises. In the 2nd movement, the first four notes of the Adagio of Bruckner's 9th Symphony play linearly as well as harmonically a major role. A four-bar chorale-like sequence of chords, which I wrote down as an eight year old boy after hearing a Bruckner symphony for the first time, provides the contrast, initially in ppp and finally at the climax of a 20-bar Passacaglia, whose bass line is extracted from a 3rd theme. In the closing stages, the material of the movement is quoted again over a held note e' before the Adagio fades out in extreme ppp. The toccata-like Finale maintains its forceful character by means of the dotted rhythm which dominates large sections of the work. Insertions of various Bruckner tone sequences and motifs structure the form of the movement, which finally achieves in sweeping movements over a pedal-point (A+B-flat) its majestic climax and conclusion. 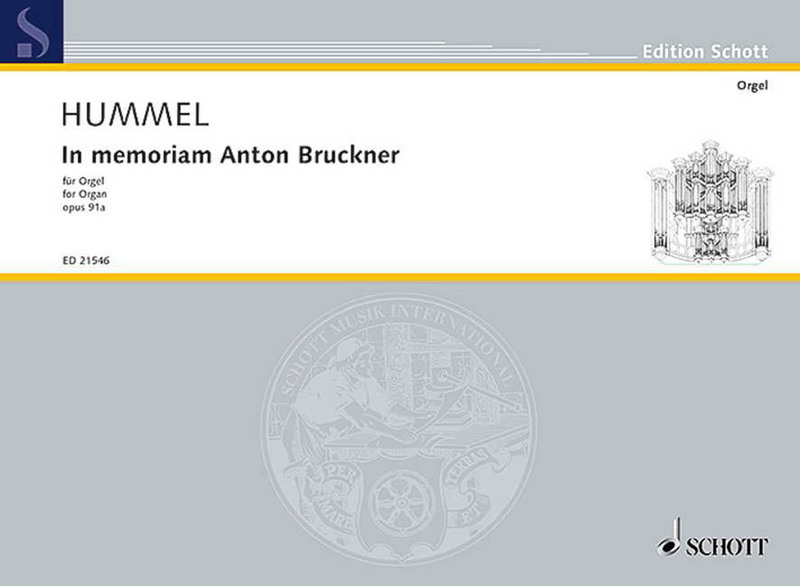 "In memoriam Anton Bruckner" was written in 1989 and premièred in the Gewandhaus in Leipzig by Erwin Horn. During those days of historical significance in 1989, as the East German revolution started and the opening of the east-west border in Germany and re-unification began to look like a serious option, an opportunity was proposed to me through contacts with Gewandhaus-Kapellmeister Kurt Masur - symbolic figure of the peaceful Revolution - of a concert on the substantial organ of the Gewandhaus in Leipzig with a first performance of a work by Bertold Hummel. The master chose, taking up a suggestion, the title "in memoriam Anton Bruckner" for his three-section, almost half-an-hour long opus 91 and re-worked in it - more or less perceptibly or enciphered - symphonic motifs from that composer. In the adagio middle section, one hears "misterioso" and as if in the far distance a three-bar chorale line consisting of a sequence of five ("distantial") major chords (E-flat : A : F-sharp : C : B), apparently in perfect Bruckner style. The question "Where did he get that from?" remained unanswered, even after the most concentrated wracking of brains. It sounded so much like Bruckner, yet was not. It was the fate of this chorale line to lead the work "in memoriam" from darkest "ppp" depths to the musical climax "fff" in the adagio. The first performance of the work took place - in the presence of the enthusiastically applauded composer - on the 19th December, 1989 in the Gewandhaus, Leipzig, 24 hours precisely after the final and biggest peace demonstration during the last days of the "German Democratic Republic". This impressive silent procession with candles along the Leipzig ring road was led by Kurt Masur, followed by hundreds of thousands, among them Hummel and Horn with their wives. The great improviser on the organ, Anton Bruckner, could never tie himself down to write something in keeping with his scale and greatness. But many composers for the organ have come close to realising such ideas. This can of course happen in the most different ways. The most frequent approach is to borrow something from his symphonic material, - form, pathos, even harmonic ideas - and thus to conjure up an organ as Bruckner saw it. Bertold Hummel does this most impressively in a Fantasy in three movements full of improvisatory drive and polyphonic technique. In this, he takes the initials A and B(-flat) as a motif and rhythmic gestures primarily from the last two Bruckner symphonies as an expressive impulse and creates a grandiose, large-scale example of a genuinely German organ symphony. 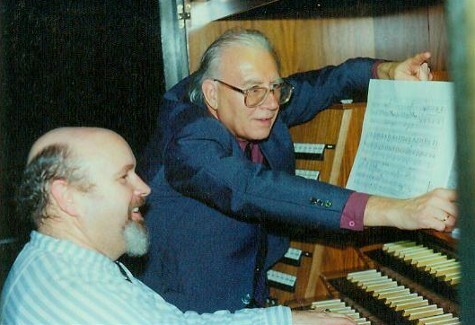 The requirements for this are not only a great organ, but also a virtuoso interpretation. With his symphonic Fantasy in three movements, Hummel has produced a gripping work which loses at no point of its ca. 25 minutes its attraction; a piece well worth practising. The surprise of the evening, the première of the opus with sub-title "In memoriam Anton Bruckner" by the Würzburg composer Bertold Hummel, awoke increasing enthusiasm with every bar, recalling with respect the mighty dimensions and the long symphonic breath of Bruckner, rejoicing in a proliferation of sound. Such daring but nevertheless charming mixtures, superimposed in numerous but transparent layers above one another, have seldom before been heard on the Gewandhaus organ. It was good that the composer himself could be there for this première success. The open border between the two Germanies leads here also to health-restoring normality!